Is simple to turn of the start with Windows 8.1 of the speech recognition, this solution is for Windows 10/7! 1.) ... Solution 1: Deactivate the speech recognition on Windows Start! 2.) ... Solution 2: If Windows Speech Recognition can not be started! 1.) Solution 1: Deactivate the speech recognition on Windows Start! With the right mouse button, click the speech recognition microphone and select options and uncheck the "Run at startup" (... see picture 1 arrow 1 and 2). (Image-1) Turn off to start speech recognition with Windows 8.1! 2.) Solution 2: If Windows Speech Recognition can not be started! and remove the value (entry) speech recognition! The question is often asked, for the following reason, because the speech recognition is quite annoying if it is not needed or the microphone is not plugged, but it is not a big effort to disable it and can also be solved by inexperienced Windows users Be. This solution is also suitable for Windows 10 and server 2016/2012! Windows-8 - FAQ-197: Disable auto start of the speech recognition in Windows 8.1 (turn off)? How we uninstall speech reginition from pc? Shut off speech recognition windows 10? How do i disable speech recognition in windows 8? Turn off speech recognition windows 10? Windows 10 turn off speech recognition? Turn Off Text to Speech Windows 8? How to close speech recognition on windows 8? How to disable speech recognition in windows 10? How to turn off voice recognition? Dictation in windows turn it off? How to turn off speech recognition windows 8? How to stop voice comand on windows 8.1 phone? How to uninstall voice recognition in windows 8.1 pc? How to disable voice recognition in windows 8.1? Switch off speech recognition windows 7? How to turn off windows speech recognition? Turn off voice prompts for windows 8.1? Begin speech recognition for windows 8.1? How to remove speech recognition software from windows 8.1? 8.1? Turn off speech recognition 8.1? Windows 8 voicr recoginition uninstall? How to remove the speech in win8.1? Win 8 turn off Text to Speech? Windows 8 turn off voice prompts? Voice command windows 8 triple click disable? Disable w8 speech recognition sw? How to stop voice in windows 8.1? Windows 8.1 speech recognition not running? How to off the voice at back in windows 8? How to deactivate the sound recognition of windows8..?? How to turn off speech recognition? How to deactivate speech recognition in windows 8? How to switch off the voice comands in win 8.1? Windows 8.1 disable speech recognition? Stop voice on window 8.1? Stop windows from speaking text at start up? Turning off the voice recognition on a Toyota? How to stop speech recognition windows? How to stop windows speech recognition? How to stop speech recognition in windows 7? Windows phone disable voice activation? Commands on how to stop speech recognition? How remove speech reconigation in windows 7? Turn Off Speech Recognition in Windows 8.1? Turn off facial recognition microsoft windows 8? Disable win 10 voice control? Turn on microsoft speech recognition? How to remove voice prompt windows 8? Disable Speech Recognition Windows 10? Disable text to speech windows 8? Windows 10 turn off voice recognition? How to stop the speech recognition for windows 8.1? Stop Speech Recognition Windows 10? Remove voice command on 8.1? How to disable automatic voice in windows 8? How to disable the windows speech recognition status box? Text to speech software download for windows 8.1? How do I disable speech recognition in windows 8.1? How to turn off speech recognition windows 7? Windows 10 how to turn off speach? How to switch off voice recognition in windows 10? Disable voice commands on window 8.1? How do you turn off dragon? Turn off text speech output for windows 8 pc? How to turn off windows voice search 8.1 mobile? How to stop audio speaking in windows 10? How to disable speech recognition? Turn off text to speech windows 10? Windows 8.1 turn off voice? How to turn off speech on windows 7 phone? How to uninstall windws speech recognition from windows 8? How do you turn mic. on to speak instructions? How to turn off a speech in windows8? How to stop auto voice on laptop? Turn off voice recognition windows 8? Windows 8.1 how to stop speech? How to turn off voice control on windows 7? Turn Off Speech Recognition in Windows 8? Windows 8 turn off text to speech? Disable Speech Recognition Windows 8? Windows 8.1 turn speech recognition off? How to turn off auto start voice recognitio win 8.1? Turn off speech recognition windows 8? Microphone turns off speech recognition? Disabling windows startup text to speech? How do i remove windows speech from windows 8? How to turn off text to speech in windows 8? How to stop the voice speaking in windows 7? How to remove sound recognition in windows 8.1? How to turn off voice recognition in windows 7? Windows phone 8.1 turn off speech recognition? How to disable speech recognition in windows 8? How to uninstall voice recognition in window 8.1? How to disable speech recognition windows 8? How to uninstall speech recognition in windows 8? SWITCh to dictation windows 8 speech recognition? How to turn off text to speech windows 8? 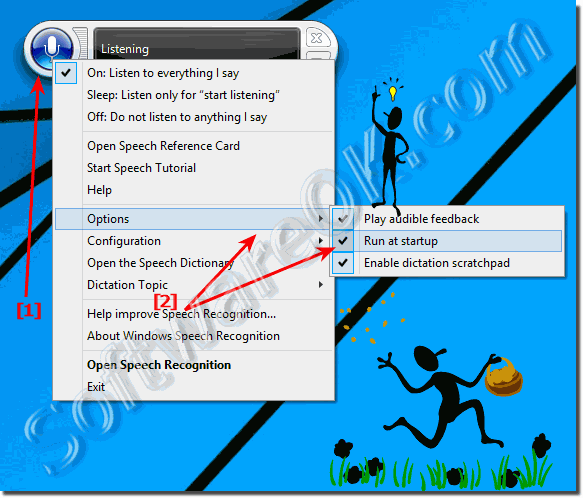 How to stop speech recognition in windows 8.1? How stop the voice in windows 8.1 starting? How to turn off speech recognition on windows 8.1? How to turn off voice control on windows phone 8 1? How to remove starting voice in Windows 8? How to stop auto tying voice window 8? How to remove windows speach recognition? How to turn off dictation windows 8?